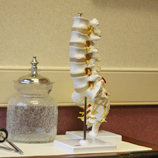 This is a condition where the disk material between two vertebrae has ballooned out of its normal position,causing compression or pressure on the nerve. In the case of herniated cervical discs, there may be pain and/or numbness/tingling in your neck and/or arm(s) as well as weakness of the arms. 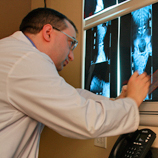 In the case of lumbar herniated disc, there may be similar symptoms in your low back and legs. This is a condition in which calcium built up on the bony structure of the cervical or lumbar spine. This is a normal aging process. However,in some instances, the calcium buildup, or spur, may impinge upon nerve or nerve root causing pain and discomfort. This can be manifested as weakness or numbness in the arm(s)or leg(s) as well. This is a condition in which calcium builds up around the canal, which houses the spinal cord (or ma innerve) or nerve roots. This too is normal aging or arthritis in the cervical spine; however, if pressure is on the spinal cord,numbness and weakness in the leg scan occur. In the cervical spine,if this condition is left untreated,it can cause paralysis. In the lumbar spine, is condition generally produces numbness, pain, and/or weakness in the legs. 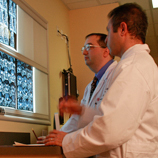 There are a variety of other conditions that may require a fusion, such as removal of spinal tumors, misalignment of the spine, segmental instability, and painful disc disease (where the pain generator is felt to be in the disc). The indications for surgery include severe incapacitating lower extremity (buttocks, thigh, leg, or foot) pain, the presence of a neurological deficit (meaning either lower extremity weakness or unpleasant numbness or tingling), intractable low back pain, recurrent disc germinations, failed prior lumbar surgery, spondylolithesis (slipped vertebra), and/or lumbar spinal instability. Many of these complaints often benefit from conservative management and because of this, a thorough trial of conservative management is often indicated. Minimally invasive should never mean minimally effective. The type of minimally invasive surgery varies depending on the goal of surgery, and should be compared to a standard open operation in terms of success rate and patient satisfaction. Examples of minimally invasive surgery include percutaneous pedicle screw placement in the lumbar spine (Sextant pedicle screws), and a unilateral muscle splitting approach and transforaminal lumbar interbody fusion in the lumbar spine. There are also minimally invasive bone graft harvesting techniques that are often employed when your own bone is needed for fusion, and in some cases Infuse can be used to completely eliminate the need for harvesting your own bone. Although these web sites have some commercial support, they are, overall, very comprehensive and cover all aspects of spinal disorders.